"Lytle Johnson Yost was born in a sod shack in the state of Kansas in the year 1881, but subsequently grew up near McClure, Ohio. His mother was a mixture of Scotch-English-American, but his father was of Pennsylvania Dutch extraction. Most of his forbearers were farmers. Lytle married Winnie Kisner, a girl whose parents came as German immigrants to the U.S.A. in the mid 19th century. Winnie's parents were pioneers on their farm near McClure, Ohio. In the summer of 1906, Lytle, along with another relative, joined a colonist train coming to western Canada, disembarking at Swift Current, Saskatchewan. There was no firm reason for choosing this particular location, simply a hunch that this area would have fertile soil. Very shortly, he had filed on the NE &frac14; 26-18-16 W3rd for the required registration fee of $10.00. Hiring a horse and rig, he drove out to see the land he had filed on, locating the surveyor's stakes at each corner. Upon digging up a shovelful of soil, he decided he had chosen well. Since he had neither machinery nor animals, the decision was made to go further west to the lumbering area near Fernie, B.C. to earn money with which to begin his farming venture in as short a time as possible. However, when he returned to Swift Current in the spring of 1907, he again found it necessary to hire out to one Tommy Wickam, whose quarter section was ten miles east of Lytle's own claim. That summer, he earned his keep by breaking broncos to the harness for his employer, an assisted in getting Tommy's crop in the ground. In the fall of 1907, he again returned to the lumbering camp near Ferney to add what he could to his small resources. He had a sad experience in trying to get to Fernie that fall. When he and his travelling companion, Leo Culham, attempted to "ride the rails," they first threw their suitcases on top of the freight car, but before they could jump on themselves, the train speeded up so fast that they could not climb aboard. They sadly watched all their worldly possessions disappear down the track, never to be seen again. They did get on board the next freight going west, but minus any personal baggage. Both men were greatly distressed by their loss. Winnie and their first son, LeRoy Yost, came to Canada on April 1, 1908 to join Lytle. She helped him break broncos, and do many other farming activities while they lived temporarily on the Archie Galbraith claim that spring. It wasn't until the following spring of 1909 that they were at last able to till any soil on their own claim and get a small crop planted. They also erected their first home on a corner of the claim, a very modest nine by twelve foot clapboard structure, insulated with tarpaper. At the same time, they built an equally small stable, to house the one cow that Winnie had brought from Ohio when she came in 1908. The buildings were erected on the west side of the road--their homestead. They soon had made a deal with a neighbor, Mr. McAlpine, to buy a team of horses from him, on a time-payment plan. From a similar source they obtained some second-hand machinery. Winnie had learned from cruel experience about planting a garden. She had planted precious seed in the government fire-guard in the spring of 1908, only to have all plants wither and die in the poorly prepared soil. In the spring of 1909, she chose a much better location and managed to harvest a fairly good supply of vegetables for winter use. Nothing came easy, they discovered. During the winter of 1908-09, a neighbor, Ben Emrick, loaned them a horse and cutter to allow them to get back and forth to Ohioville School for church services. Winnie, being musical, played the old American organ for the services in what was at that time an Evangelical Church. Francis Zeller served as the minister of the small congregation. At this point, they still had no well, so all drinking water was transported from a neighbor's well, and water needed for utility purposes was taken from a nearby slough. In season, to augment their food supply, they picked the wind fruits from the Saskatchewan River coulees, the juice saskatoons, the tart chokecherries and raspberries, to preserve them for the coming winter. Live was simple, of necessity, but there was a great deal of happy socializing among the early pioneers. When visiting in someone's home, each family would take along a precious cup of sugar with which to make candy, or perhaps a small amount of popping corn. Simple games were played, and those who were musical played their instruments -- violins, moth organs, etc. In the summertime, there were box socials, or an ice cream and strawberry social, or occasionally a debate would be waged over some issue of the day. Hard ball games were also popular with the menfolk. Children were given an opportunity to perform as well, through such gatherings as the "Children's Day" programs, when each child could display their talents with reading, skits, and musical events. Keithville was a very busy community. Since there was a growing need for a railway to aid in transporting grain from their area, Lytle rode a horse around the district in the summer of 1909 getting signatures on a petition to secure a railway spur line west from Swift Current to Leader. the railway and the village of Pennant finally came into existence in the year 1912. Pioneering was not without its sad times. In the spring of 1910, Winnie lost her second child in childbirth, a direct result of helping her husband put in the crop. That fall, she visited Swift Current for the first time in two and a half years since she had arrived from Ohio. However, that same year of 1910, there was a happy note, in that Lytle became a Naturalized Canadian citizen. There was now no turning back. Finding water on his claim became a prime concern right from the start. In 1910, Lytle hand-dug no less than two dry-well holes, each about twenty feet deep, without finding water in either of them. That winter, during a blizzard, her nearly lost his life falling into the one hold, but his wife was able to help him out safely. The following summer he hand-dug the third hold on the preemption quarter across the road allowance, and happily located a good supply of water at the thirty foot level. This necessary resource prompted them to buy the pre-emption quarter. At that time, all wheat had to be hauled the twenty-five odd miles into Swift Current, no matter what kind of weather prevailed, until at last in 1912, a new elevator was built in the new village of Pennant. It took some of the hardship out of hauling grain, notably that of shovelling all grain into box cars totally by hand. In 1912, their first really permanent dwelling was constructed on a corner of the pre-emption quaker near to the well, and also near to a newly built barn, made necessary by the acquisition of more animals. More land meant that more animals were needed to till the soil. By 1915, they had added [a] third quarter section, to be used entirely as pasture for fourteen houses and three cows. By 1918, they added yet again the Hudson's Bay quarter to their holdings, It had taken them ten years since beginning to farm to acquire a full section of land, and life seemed good. Over the years, Lytle and Winnie became parents to six children -- one of whom died at age six months of cancer. These living children were: LeRoy, Harley, Delmer, Velma and Helen. The eldest Yost son and second son, Harley, attended high school in Pennant, since a high school came into being there in 1925. All of the children found useful vocation. LeRoy became a welder innovator in Detroit, Michigan, working in the auto industry. Harley took over the family farm when his father retired, as well as farming his own land a few miles distant in the Valentine district. Delmer earned his living as an electrician, finally retiring in Spokane, Washington. Velma first of all was a public school teacher for two years before traveling east to Ottawa to work for the federal government, followed by marriage and raising a family of two. Helen also taught school for two years before she married an Air Force Officer, Leslie Mock of Pennant, who work took him to many points around the continent. There were many trying times as Lytle and Winnie tried to earn a living farming their corner of the plains, having to cope with a dry climate, especially during those terrible drought years of the 1930's. They fought with gophers, grasshoppers, and every kind of weed under the sun, besides the lack of rainfall in those years. Their farm home was burned to the ground in 1933, causing three years of hardship before a new building could finally be erected. There were happy years, of course, one of what was in 1930 when they were financially able to build their "dream house" in the village of Pennance, a fitting end to their early struggles merely to exist. Lytle obtained his first automobile in 1916, to make the personal transportation easier. Likewise, farming itself became easier as the years moved on. In the year 1928, Lytle bought his first tractor, and in 1929, the Rumely combine made harvesting seem like a breeze. It was a tremendous transition from the earlier dependence upon horses to the use of self-propelled machinery, where one man could handle all his forming alone. 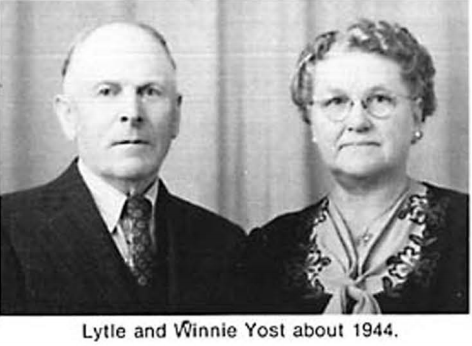 Someone must come first, and Lytle and Winnie always felt pride in the fact that they were pioneers in their corner of Saskatchewan -- pride in being able to pass on the benefit of their labors to the next generation Above all they felt a great love for their adopted land." Copywrite University of Calgary, 2008.